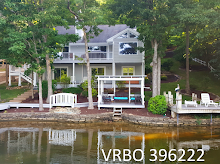 OzarkDragon.com : Look at any map of the lake and it's pretty easy to see it resembles a serpent of some sort and for many years the marketing efforts for the Lake of the Ozarks tried to use the "Magic Dragon" moniker for advertising. In fact, the annual car show and the Lake Ozark Fire Department still use it to this day. 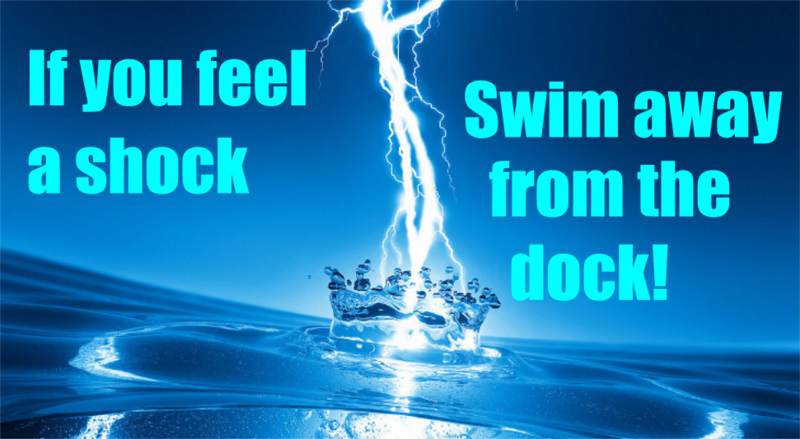 While I've always felt the imagery was appropriate, it never really took off as a brand. I always liked it though and will continue to promote this website under that primary web domain. Trailscope.com: Another domain I've owned for some time that was intended for a project involving virtual tours. It would have been sort of a Google Streetview for trails and rivers. But as the old saying goes, if you have a good idea there are already a hundred people working on it, but if you have a great idea a thousand people are working on it, and Google already has some hiking trails on Streetview, but no rivers. I'm looking at doing rivers as something to do in retirement but the rig is quite complex. But that's another story, for another blog, for another day. 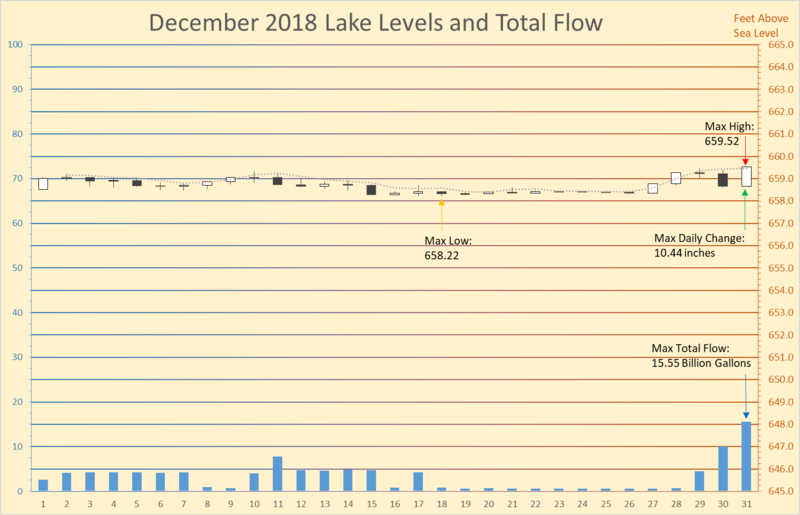 Yes, yes, I know, just another monthly lake level post. Let's just say I've been busy and the persistent cold weather has my bad attitude in high gear. So on the draw down front. Are we there yet? I'd say no, we probably have another week or two before we hit rock bottom, but things are low. Just not as low as they usually get before the draw down is over. 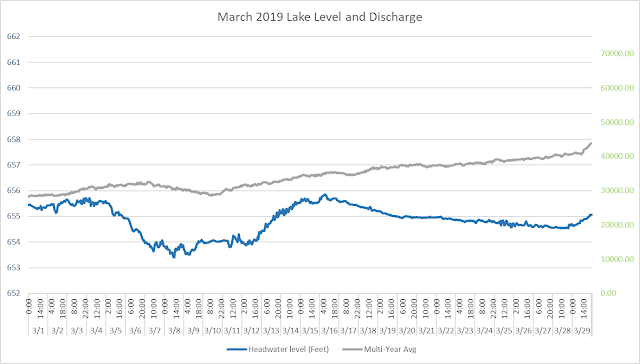 I'll post a comparison chart later and see if we can't do a little prognosticating on when we'll reach our maximum low for 2019, but typically it's around March 11th. Lake levels, lake levels. Is that all this blog is about? January is the official start to the lake draw down. 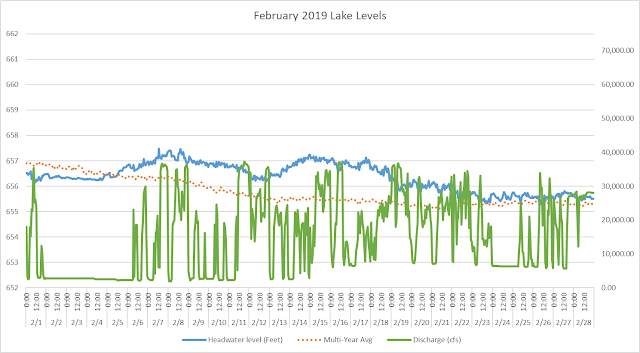 When Ameren allows lake levels to fall below "normal" in order to accommodate shoreline work, and prepare for the coming spring rains. Spring is coming. My black tail hawks are working on their nest, and the groundhogs have started sniffing around for a place to start a new tunnel under my house, so I know it's coming. 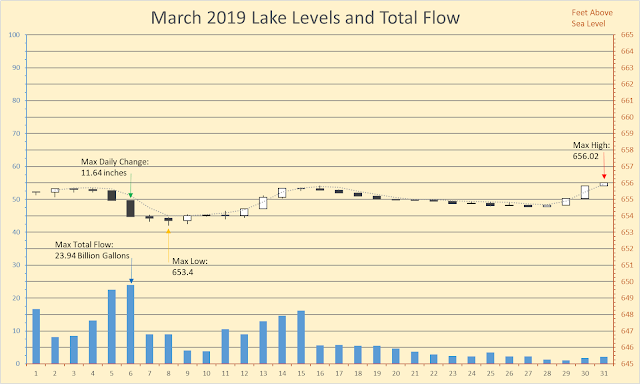 The lake has already started it's inexorable fall to the March low. Below is the hourly detail with the grey line being the new moving five year average. All in all, nothing remarkable and a nice steady incremental start to the draw down. Another year has come and gone, and with the annual draw down to prepare the lake for 2019 only days away, let's take a look at what happened in 2018. Here's a quick summary graph that I made to try and put things in perspective. The lake is still just a flooded river and water flows in and out constantly. 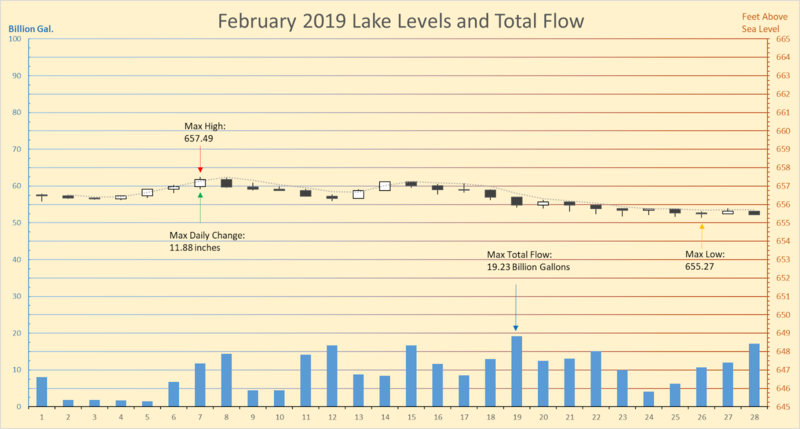 Putting up raw numbers like nearly one and a half trillion gallons of water passing through Bagnell Dam sounds impressive but what can we do to give it real meaning? I've provided some conversions to help get a grasp of just how much water that is. Also, the circle in the middle with percentages indicates Bagnell Dam's operational statistics, how much of the time electricity actually was being generated. The answer is only about 25% of the time. 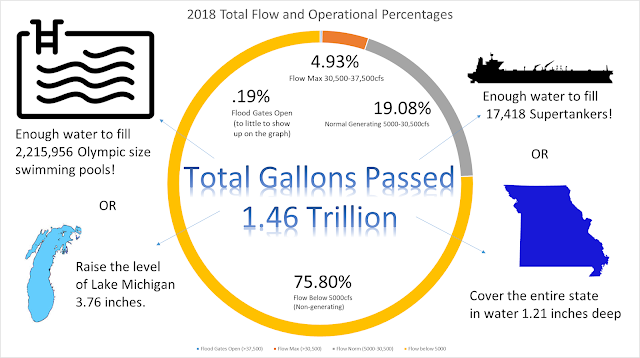 Operations in flood conditions were negligible, and I doubt the gates were actually open at all, I simply calculate that the maximum flow through the turbines is anything over 37,500cfs (cubic feet per second), but improvements to the turbines may have increased that number. I'll have to revisit that. The more telling number is the 75.8% operational time below 5000cfs, an indication no commercial electrical power is being generated beyond the "house" generators used to power the Osage Energy Plant itself. This is a very low amount of power generation, and may be due to the extensive work being done this year on Bagnell. 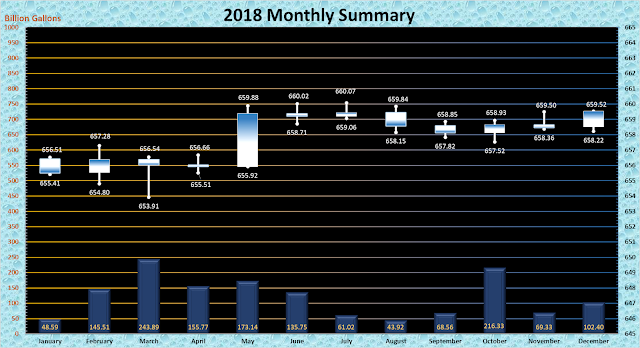 In short, Bagnell Dam was probably operating at a loss this year. 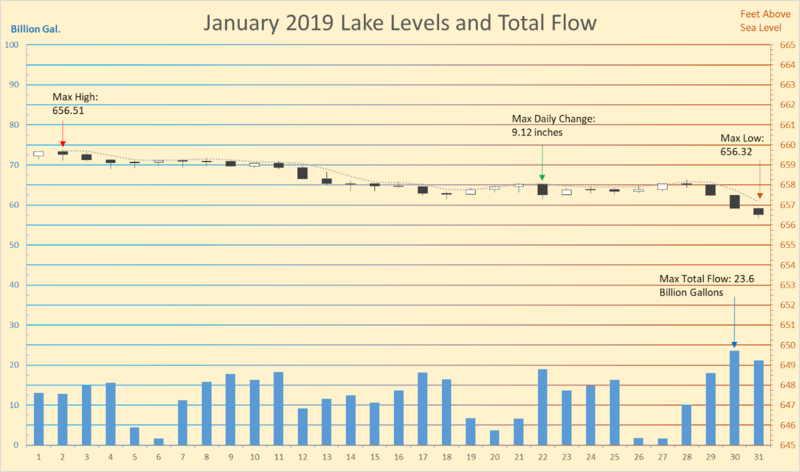 As far a lake levels themselves are concerned, this year is probably the most unremarkable we've had since 2012. 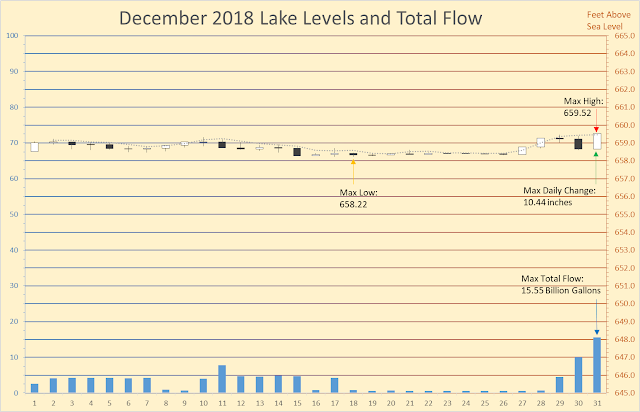 Levels were right along the guide curve with no surprises. Below is the candlestick summary for each month of the year. 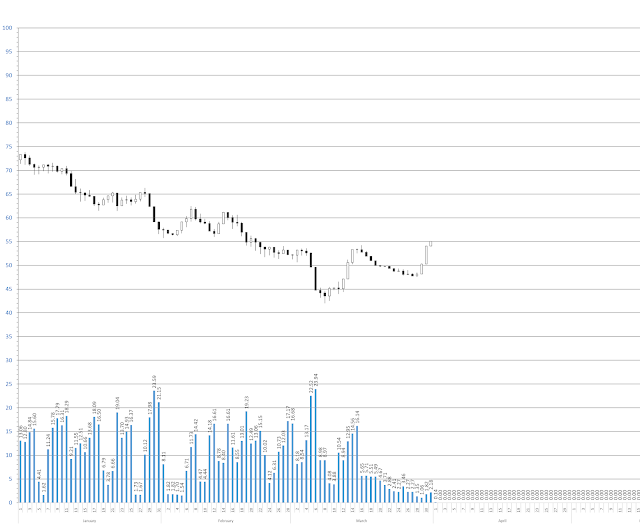 Below is the daily candlestick for the entire year. And finally, a candlestick summary of every month from 2010 to 2018. Did I see an article in the Lake News Leader last week about the draw down starting? What, did they just look at the calendar and go "Hey, it's December! Time for the draw down to start!" 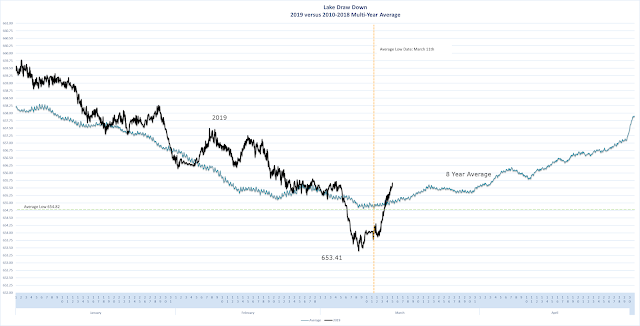 As you can clearly see, the annual draw down of the lake has not started in any real sense. With lake levels nearly at full pool on the last day of the month, there's a long way to go. 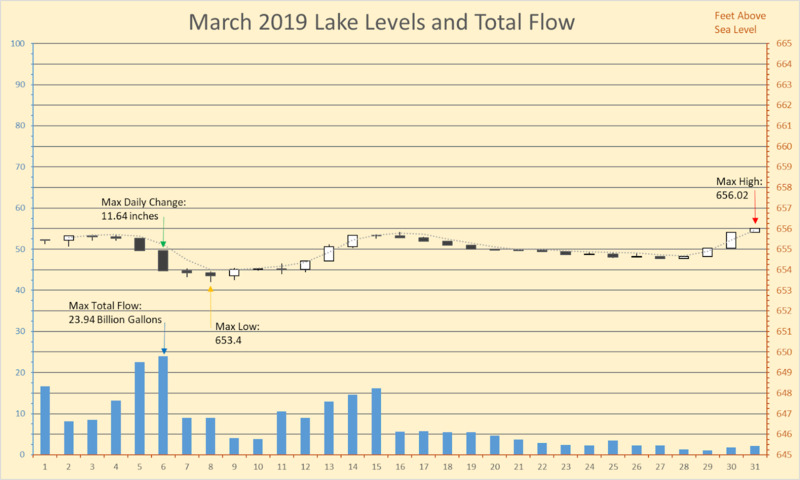 With Ameren's ability to lower the lake level one foot per day at full generation this time of year, there's no real hurry to get to the expected low of about 654' by the first week of March. 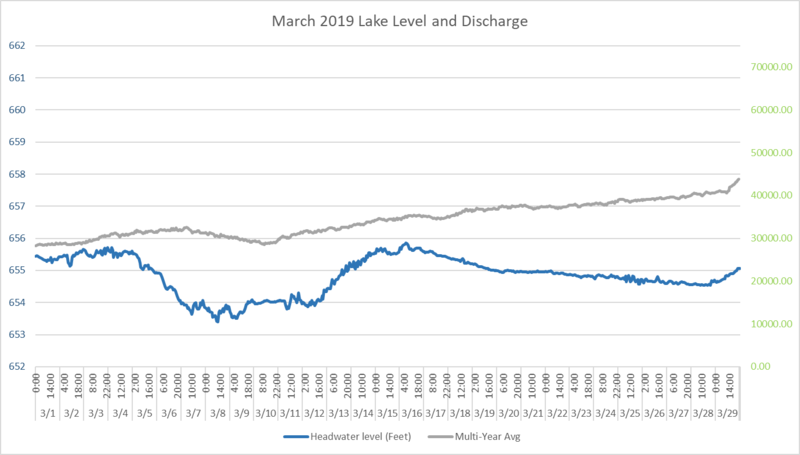 One interesting note regarding the hourly detail graph, notice that the multi-year average (grey) shows a little rise in lake levels the last week of the year, and this year (blue) followed that same pattern. 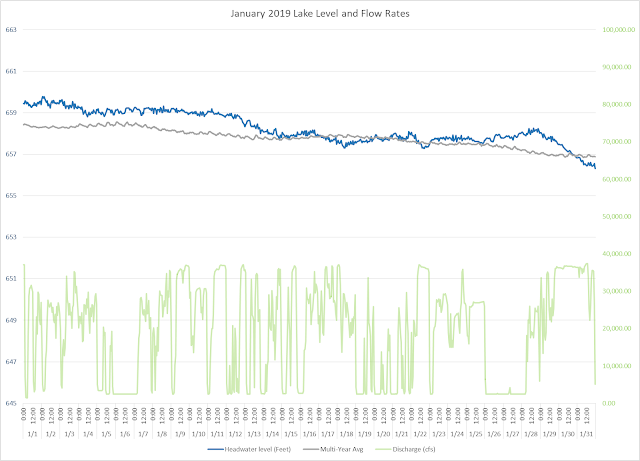 It's as if they always generate power, indicated in yellow by flow rates above 10,000 CFS, the week of Christmas.